Onstage and Backstage podcast from Hal Leonard is available on iTunes and Libsyn. Each episode authors and their guests have a chat about the topics of their books. 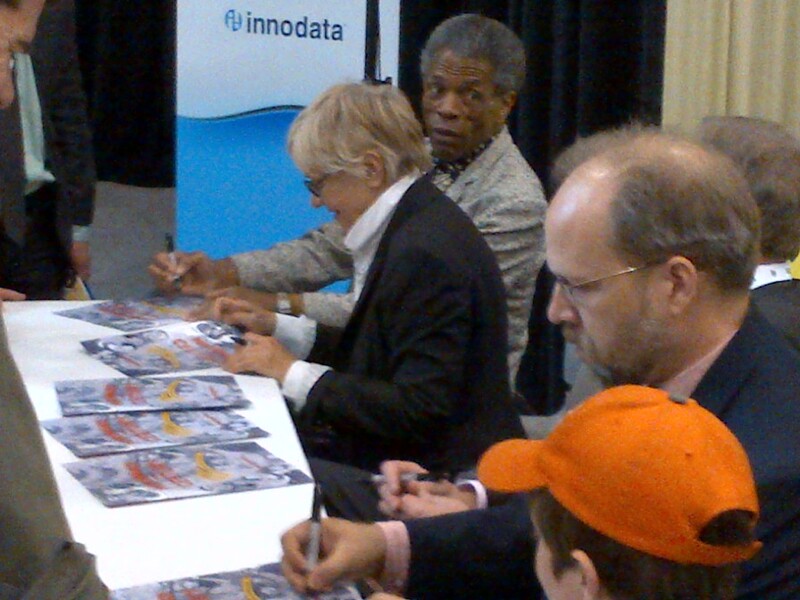 Today, we have a special treat for those of you who were not able to attend the Performance of the Century book signing in New York City December 2012. You can listen to the entire discussion for free on our podcast! In 2013, Actors’ Equity Association turns 100 years old. To celebrate, they’ve written a book, penned by Robert Simonson, called Performance of the Century. In this episode of Onstage and Backstage podcast, Simonson, actors Lee Roy Reams and Danny Burstein, AEA president Nick Wyman, and the book’s cover illustrator “Squigs” come together at Drama Book Shop in New York City to talk about this beautiful publication and 100 years of AEA. Actors’ Equity Association, the union representing stage actors and stage managers, turns 100 years old in 2013. Shaped by the inequities visited on performers in the 19th century, the union has shaped the landscape of the professional American theater. Founded in 1913, it became a force to be reckoned with in an historic 1919 strike – the most entertaining and dramatic one (naturally) the nation had ever seen. Since then, Equity has gone beyond securing the safety, health, and rights of stage actors, to become arguably the most progressive force in theater. It stared down not only obdurate producers, but segregation – on and off the stage, the political hysteria of the blacklist years, and the challenge of the AIDS epidemic, its members forming what would become Equity Fights AIDS. It entertained the troops of several successive American wars and fostered the spread of stage culture across the land, from the government-fostered productions of the Depression-era Federal Theatre Project to the Equity Library Theatre, which offered the classics to the public at bargain prices. It oversaw the little theater movement’s growth into the regional theater movement, and was there when Broadway begat Off-Broadway, and then Off-Off-Broadway. To read this resplendent new book, lavishly illustrated with historical images and stunning photographs, is to learn not only the union’s glorious past, but that of American theater itself. The following is an excerpt of the book Performance of the Century: 100 Years of Actors’ Equity Association and the Rise of Professional American Theater by Robert Simonson (Applause Books), as posted by Playbill. Actors’ Equity Association is that most improbable of institutions: an artists’ union. It represents and looks out for the welfare of more than 48,000 actors and stage managers in the United States. In 100 years, it has not imploded, been exploded, or been declared illegal. It should be in Ripley’s Believe It or Not! As a journalist, I have covered the American stage for 30 years. During that time, I have tended to take Equity for granted as one of the immutable realities of the theatre. Yet, as I researched this book, it quickly dawned on me that Equity’s very existence was basically unimaginable. We tend to associate unions with blue-collar jobs — work that is often hard and unglamorous to begin with and would be so much worse if a union didn’t look out for its practitioners. A labor organization representing an inevitably elective profession like acting? Absurd, really. Surreal. Artists have never managed it. Nor novelists, nor poets. That a labor union governed by performers, and speaking for performers, has survived for a century is nothing less than a miracle. Certainly the people who controlled the theatre back in 1913 didn’t think Equity would last a year. Actors were too self-interested ever to act in concert; too proud ever to call what they did a craft; too refined and impractical ever to worry themselves with the base matters of business; and too insecure ever to turn down work, no matter how financially punishing and personally humiliating the conditions. So went the conventional wisdom. And for much of the 19th century, the evidence did not seem to contradict it. Every attempt to organize actors had failed. But by the 1910s, working conditions had become unendurable. Actors were not paid for rehearsal. They were made to buy their own costumes. They were abandoned when shows failed on the road. Contracts were regularly broken by unscrupulous producers. There was no security. Action had to be taken. And in 1919, it was. The fledgling union found its feet and its teeth six years after it was formed. Keep reading this excerpt on Playbill.com. Robert Simonson is the author of Performance of the Century. Below is a Q & A he did with Backstage Magazine. You talk about that magical moment when an actor receives his or her Equity card. Can you describe how Equity membership transforms at actor’s life? I’m not an actor, and I’ve never been an actor. [But] I’ve asked that question of other actors as a journalist, and it’s always a special moment. Every actor remembers when they get their Equity card because it just means a lot. It means a lot professionally—I mean, a lot of doors are now open to you. But it also indicates a certain kind of arrival, like you’ve made it. Your acting career may not be thriving yet, but you are a professional actor. You write about Equity promoting racial diversity even before the Civil Rights Era. Can you talk about that? On a lot of cultural issues [and] a lot of social issues, Equity was ahead of the curve. They were always fighting for the rights of the underserved and the underprivileged. And so in the 30s, long before the Civil Rights Movement, long before various other efforts to better the lot of African Americans and other ethnic groups, they were fighting for the rights of those members of their union—trying to get directors and producers to cast integrated casts, and just generally making sure that the members of the union who were black or other ethnicities were treated just the same as the white members of the union…Equity always stood up for what was right. They stood up for their members. So they have a long history of doing that. And they’ve done things for actors with disabilities. I believe it was in the 1990s or the late 80s [that] they started fighting for the rights of actors with disabilities, to make sure that they were seen for parts—particularly when the part in the play was for a person with a disability, that actual actors with disabilities could be considered for these roles. Keep reading this interview on Backstage. This weekend, the Special Tony Award was given to the union Actors’ Equity Association, which will celebrate its 100th year anniversary this fall. Among the many festivities to come with this celebration, Applause Books will publish Performance of the Century: 100 Years of Actors’ Equity Association and the Rise of Professional American Theater by Robert Simonson. Read about the Special Tony Award on tonyawards.com. 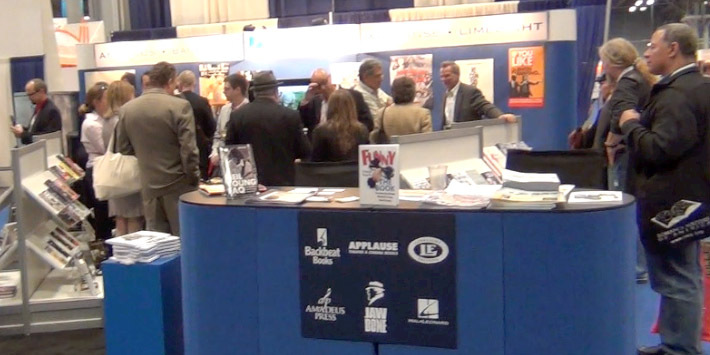 Thank you to everyone who stopped by the Hal Leonard booth at Book Expo America this week. We love meeting with old friends and making new ones. We had great authors come by and talk with librarians, book sellers, and teachers about their books and do book signings. 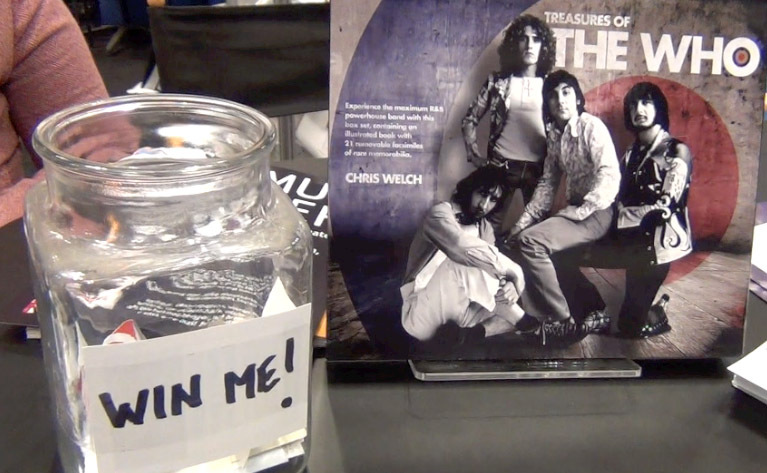 We gave away a copy of Treasures of the Who (congrats to Keaton Babb!). And we even hosted a panel discussion with Actors’ Equity at the Downtown Stage. What a week! 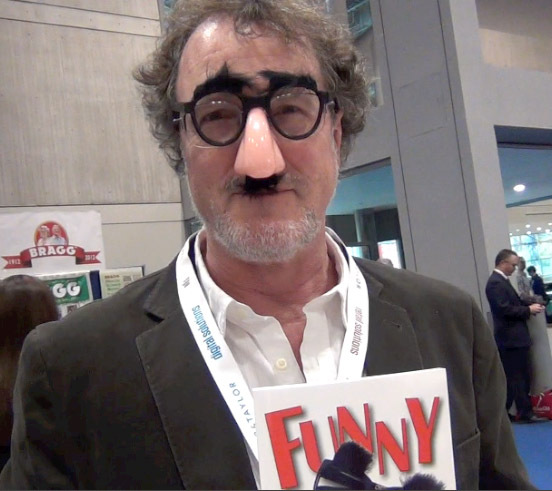 David Misch, author of FUNNY: THE BOOK, handed out rubber-nose-and-glasses to everyone who walked by on Tuesday. 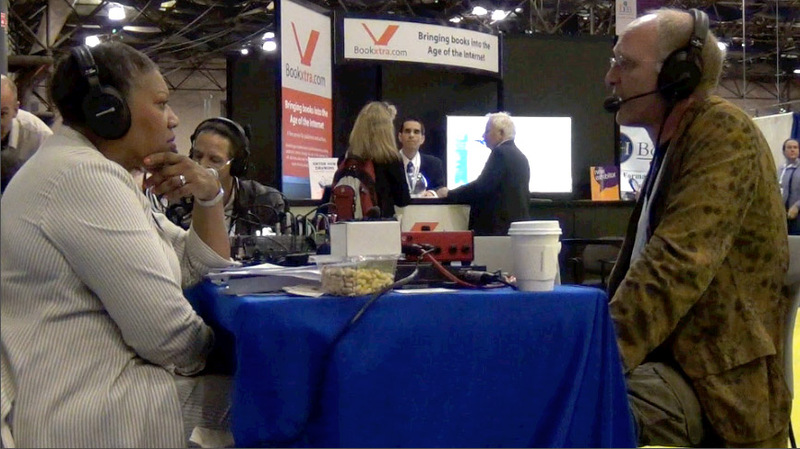 Sirius Radio talked with many of our authors. Here, Dave Thompson talks about his book HEARTS OF DARKNESS. The Hal Leonard booth is a popular place to be! 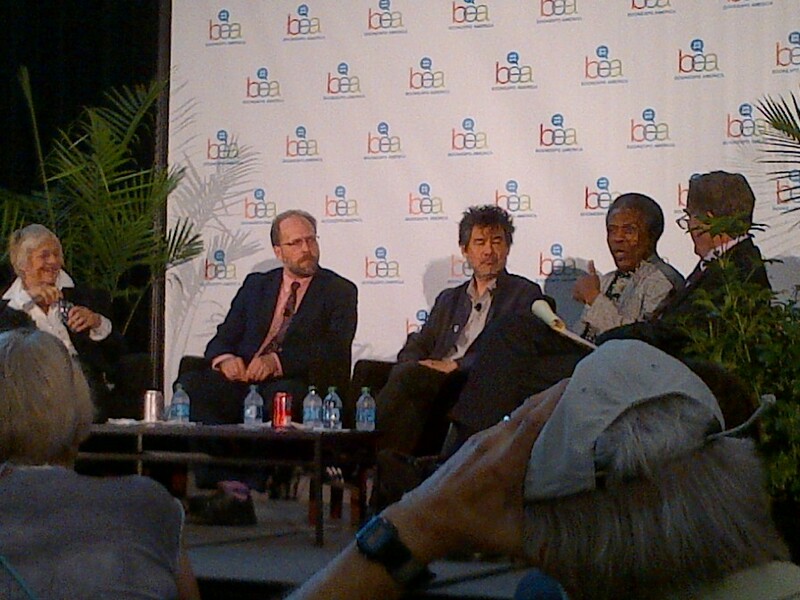 Click here for more photos of Hal Leonard at BEA.